Contactless ticketing enables the owner of a portable object (contactless smartcard, NFC mobile phone, etc.) to enter and travel in the transit networks. The transport titles (transport contracts) are loaded in the portable object by a vending machine, at a booth or through Internet at home. This loading is protected by a secure application module (SAM) located in each terminal issuing transport contracts. This SAM contains the cryptographic keys necessary for vending operations. Transit networks face today a high increase of portable objects and simultaneous transactions. A SAM cannot answer these requirements since, being able to manage only one operation at a time, a large number of SAM would be necessary in a central system, particularly during peak periods of the month. Spirtech has designed and markets the HSM Calypso PCI-S, a PCI board for servers which secures remote ticketing transactions and complies with Calypso. Implemented in the central system, the HSM Calypso PCI-S is a powerful secure module which advantageously replaces 100 to 5,000 SAM, increasing the speed of transaction and reducing maintenance costs. This is also the right solution to manage the security related to deployment of NFC phones in transit networks, Account Based Ticketing, etc. Spirtech also markets the HSM Calypso SAM-S20, which manages up to 20 simultaneous transactions per HSM. This solution, software compatible with the HSM PCI-S, offers a simpler management for pilots and test phases, and for small ticketing systems. The HSM Calypso centralizes the management of multiple Calypso sessions (from opening a secured channel to the session ratification and the channel closing). 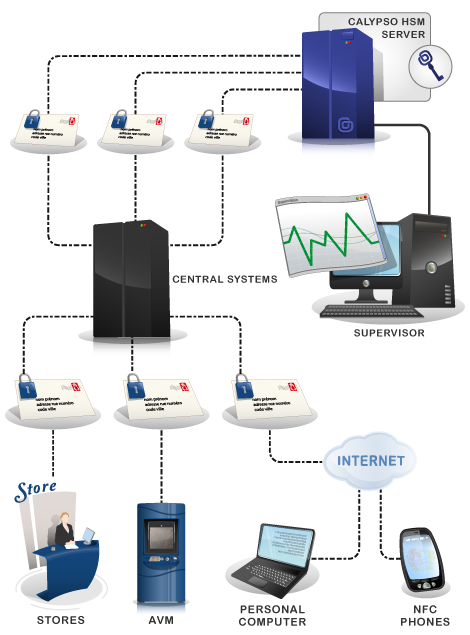 The security of the transactions is ensured directly from the central system. Thus, in addition to the performance and services improvements, the HSM Calypso decreases the risks of fraud. Spirtech may also supply a JAVA connector for the Calypso HSM library. This interface simplifies the implementation of remote selling services in teleticketing systems using this technology. Secure the remote and simultaneous transactions done by teleticketing system. Compliant with the Calypso standard specifications. Management of many groups of independent keys to facilitate interoperability.